THE IECD PHD & MA PROGRAMS Fieldingâ&#x20AC;&#x2122;s Infant and Early Childhood Development (IECD) graduate programs are multidisciplinary, relational-based, and focused on the critical period of development between infancy and 6 years of age and the well-being of families. Our IECD PhD program is geared for students already working in related fields, often with other advanced or professional degrees. Students are focused on expanding their knowledge base and practice while developing a niche specialty. As a student, you will be engaged in cutting-edge research while integrating existing research into your overall work. As a result, you will be prepared to influence change in many disciplines such as social work, infant mental health, education, early intervention, occupational therapy, speech and language, health care, mental health, physical therapy, and others. The PhD curriculum spans the range of development, including typical and atypical trajectories. It integrates physiological, social emotional, cognitive, behavioral, relational, and cross-cultural perspectives, as well as reflective practice. You will collaborate with faculty who advise, mentor, and evaluate your work based on doctoral-level standards. Our IECD Masters program is tailored to students working or starting out in a related field and wanting to expand their applied knowledge base and skills through our specialized training and education. Our multidisciplinary curriculum, focused on infants, children, and families, helps students to better understand and work with early child/caretaker relationships, typical and atypical development, disruptive behaviors, difficulties with school readiness, challenges with social emotional regulation, and learning problems. Our MA curriculum integrates brain development as well as social emotional, cognitive, behavioral, relational, and cross-cultural perspectives. Reflective practice is a key area, as well. The IECD MA will support specialization and allow you to make a difference in a wide variety of disciplines, including early childhood education, early intervention, infant mental health, health care (nurses, nurse practitioners, and physicians), allied health care, social work, mental health, and others. This program will also lay the foundation for the IECD PhD, should you wish to pursue this path. Courses in the IECD address competencies needed for you to be endorsed through a state belonging to the Alliance for the Advancement of Infant Mental Health. The Alliance is active in many US states, as well as Australia and Ireland. For both our PhD and MA, we use our unique distributed learning environment, which combines live online instruction and self-directed learning, allowing you to pursue your degree while working full-time in your field, traveling, and living in your current community. THE IECD PHD & MA PROGRAMS STUDENT TO FACULTY RATIO 7:1 For more than 40 years, our dedicated and distinguished faculty members have delivered learnercentered graduate education that enables students and alumni to lead and influence positive change for individuals, communities, and organizations. LIBRARY SERVICES Our online library includes over 220,000 e-books, 50,000 scholarly journals, and millions of articles, thousands of online dissertations, and a collection of streaming clinical interviews. WRITING CENTER Fieldingâ&#x20AC;&#x2122;s Writing Center offers individual appointments with a writing coach, as well as live and recorded webinars, videos, and a self-directed writing course designed by Fielding faculty. MENTORING AND ADVISING: All students in the MA and PhD programs will be assigned a mentor, a key person who will support your efforts to move through the program in the way that is most effective for your needs. You will also be assigned an advisor to help you plan for your coursework and completion of the program. Fielding graduates are leaders in their professional and personal lives as consultants, professors, community activists, authors, nonprofit executives, administrators, and coaches. GRADUATE Your graduate experience will culminate with a graduation ceremony shared with family, friends, and colleagues. ATTEND AN INFORMATION SESSION We offer on-demand and in-person information session options for your convenience. A personal map through the learning process that includes a preliminary outline for the action- oriented research project that will ultimately become your dissertation. PREPARE & ATTEND NEW STUDENT ORIENTATION Assess your academic readiness; evaluate your research, personal skills and learning resources; set your academic and professional goals; and develop your support group of faculty and peers. COMPLETE ENROLLMENT PROCESS Receive your acceptance letter and enrollment documents approximately one month before the term start date. Your tuition payment instructions will be included. APPLY TO FIELDING Go to fielding.edu/apply and follow the step-by-step instructions. Our faculty members have diverse interests and backgrounds and are available to collaborate with students in courses and on dissertations that advance work that is important to the individual student. Fielding Graduate Universityâ&#x20AC;&#x2122;s IECD PhD and MA aim to create a positive impact on their students and on the work they do in their communities. As such, our programs are designed for professionals who want to inspire others and take the lead in their fields. IECD MA and PhD students transform their personal and professional lives through intellectually rigorous academics; work with supportive, mentoring faculty; and participation in a learning environment that honors and integrates their life and professional experiences with their academic one. Energized by the freedom and encouragement to explore their interests, our students care deeply about the people with whom they work, their peers, their colleagues, and their communities. They are able to move beyond knowledge consumption to become knowledgeable and effective practitioners. The IECD program focuses on developing thoughtful, effective, and compassionate practitioners who strive to make a difference in the world through their work with infants, children, and families. Our students and graduates are lifelong learners who participate in solving the issues facing the populations with whom they work. Even after graduation, they are committed to continuing their learning and expanding their understanding of their practice in order to continue making informed, positive contributions. .
From our online library to our student advising, tuition, financial aid, registrar, and help-desk support areas, Fielding staff members strive to make our support services to students useful and timely. Accommodations for students with disabilities and study aids for all students are available. A mainstay of our learning ideology from the founding of Fielding has been in-person sessions between students and faculty held throughout the US and globally. These are an important way we connect and re-connect within and across our disciplines. While they are not mandatory for either our PhD or MA students, we strongly encourage all students to attend. Mine is the only PhD program in the world in Infant and Early Childhood Development with an emphasis on mental health and developmental disabilities. Fielding’s IECD PhD and MA programs are multidisciplinary degrees, so you will study a wide range of areas and issues that affect the well-being of infants, children, and families. Our faculty teach typical and atypical infant and family development using a curriculum that includes physiological, emotional, cognitive, behavioral, social, and cross-cultural perspectives. You will also collaborate with faculty who advise, mentor, and evaluate your work based on masters and doctoral-level standards, as applicable. The PhD program is a wonderful opportunity to gain knowledge in early childhood development, infant mental health, and developmental disabilities in an interactive online setting. It is a rich opportunity to experience and learn with multidisciplinary providers and educators around the world. In addition, we offer a sequence of three classes in reflective practice. These growth-fostering and supportive courses will be a fabulous resource for those who are pursuing endorsement in infant mental health. Our IECD PhD and MA program is designed for working professionals who wish to broaden their knowledge and understanding of infant and early childhood development. With this degree, you can influence change in many disciplines: childcare, health education and community health work, mental health counseling, occupational therapy, physical therapy, psychology, social work, special education, and speech-language pathology, among others. childhood development using a multidisciplinary framework that includes relationships, mental health, education, occupational therapy, speech and language, reflective practice, brain development, and neuroscience. PHD TUITION & FEES $8,740/term Subject to annual revision. Visit catalog.Fielding.edu for details. DOCTORAL CONCENTRATIONS You can individualize your doctoral program by selecting one of our shared doctoral concentrations. Learn more at www.Fielding.edu/DoctoralConcentrations. $720/credit Subject to annual revision. Visit catalog.Fielding.edu for details. You can individualize your doctoral program and expand your professional expertise by selecting one of our optional doctoral concentrations: COMMUNITY COLLEGE LEADERSHIP FOR CHANGE addresses the most current issues in community colleges and builds your knowledge and skills as a scholarpractitioner. It allows you to position yourself as a community college leader based on the American Association of Community Colleges (AACC) leadership competencies. CREATIVE LONGEVITY AND WISDOM provides a focus on aging populations locally, nationally, regionally, and globally. Promote barrier-free, sustainable, and nurturing environments, and foster populations that will promote justice for aging populations. DUAL LANGUAGE prepares educators to design an instructional program that supports bi-literacy development for language-majority and language-minority students. The focus is to bridge the achievement/opportunity gap for diverse under-served populations while addressing the goals of bilingualism and the development of multicultural competencies. 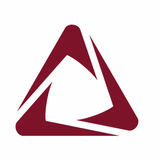 CUSTOMIZE YOUR DEGREE EVIDENCE BASED COACHING offers an interdisciplinary approach to integrating research-based coaching theory with professional practice in organizational and individual coaching. Participants will study the core theories that underpin principal practices of individual and organizational coaching, and they will undertake individual research to integrate theory with practice in individual and organizational settings. INCLUSIVE LEADERSHIP FOR SOCIAL JUSTICE explores the relationship between transformative learning and social change for social justice. Become an effective and creative leader-participant in local and global efforts at creating a just, secure, and environmentally sustainable world. LEADERSHIP OF HIGHER EDUCATION SYSTEMS focuses your doctoral study on the knowledge and skills you need to become a leader and change agent in higher education institutions such as 4-year colleges, universities, and graduate schools. MEDIA, TECHNOLOGY, AND INNOVATION focuses on the ways in which media, information, and knowledge are transforming societies, cultures, organizations, and our own selves. Learn to live in an online world through virtual teams, and explore topics such as social justice and ethics. ORGANIZATION DEVELOPMENT focuses on theoretical knowledge and practical skills that will allow you to lead change in the workplace. Learn how to engage in online environments and collaborate with other management and consulting leaders. REFLECTIVE PRACTICE/SUPERVISION is designed to teach you the theory of reflective practice/supervision and how to apply it to your professional work experiences in clinical, educational, administrative, or organizational systems. SOMATICS, PHENOMENOLOGY AND COMMUNICATIVE LEADERSHIP combines and integrates scholarly theory and mastery of embodied mindful awareness with substantial grounding in transformative phenomenology along with the interpretive and practical dynamics of social constructionism. SUSTAINABILITY LEADERSHIP produces leaders in businesses, nonprofits, governments, and educational institutions. This concentration includes the study of the history and practice of sustainability efforts, organization development for sustainability, and strategy development for sustainability. FREQUENTLY ASKED QUESTIONS Q: What can I do with my degree? A: The IECD PhD allows you to become an expert in the specialized areas of infant and early childhood development and families. Our graduates may advance their careers in their chosen profession, start clinics, teach and train, pursue work in policy and advocacy in government and/or the private sector, conduct research, and take on roles of leadership. The IECD MA will develop your expertise and, depending on your profession, will allow you to advance in your career or enhance your current practice by giving you a specialty and an area of expertise. This, in turn, may increase your income and broaden your career opportunities. For example, an early childhood educator with an MA has the potential to go into administration, or a nurse practitioner can specialize in Infant Mental Health and become a leader in the rapidly expanding area of child/parent well-being in neonatal intensive care units (NICUs). Courses will also address competencies for Alliance Infant Mental Health Endorsement. Q: What are the residency requirements? A: For the IECD PhD, the only residency requirement is the New Student Orientation (NSO), which lasts approximately 5 days. The January and May NSOs take place in Santa Barbara, CA. The September NSO takes place in the Washington, DC area. There is no residency requirement for the IECD Masters, although students are welcome and encouraged to attend our University-wide national sessions, which are held several times a year in different parts of the United States, as are our PhD students. In addition, the MA New Student Orientation (NSO) is held live online. Q: Is the IECD program accredited? A: Yes. Fielding Graduate University is accredited by the Western Association of Schools and Colleges (WASC) and has been since 1982. Q: What is the age range of students in this program? A: Our students span the age from those in their late 20â&#x20AC;&#x2122;s to 65+ years. Q: How many hours per week does one spend on coursework on average per class? A: Students who enroll in 12 credits a term spend an average of 32 hours a week on their studies depending on the nature of the specific coursework. Q: How many years does it take to graduate from the university with the degree? A: If the suggested number of courses are taken each trimester, the PhD takes approximately 3 Â˝ years to finish, and the IECD MA takes just under 2 years to complete. Q: How can I limit my tuition costs? A: This applies only to IECD PhD students. Tuition is charged by the term and not by the credit hour, so students can take advantage of those times in the year when they are more available to complete coursework. IECD doctoral students who are nearing the completion of their programs are eligible for advancement to candidacy status, which grants a 30% reduction in tuition. In addition, all students are eligible for up to 12 months of leave over the course of their enrollment, although such leave may extend time to degree. Visit Tuition at www.Fielding.edu/tuition and Financial Aid at www.Fielding.edu/finaid for more financial planning tips. Q: Who are the faculty members for the IECD programs? A: All faculty in the program hold advanced degrees. They are committed to applying their expertise and experience to help students achieve their goals. They also span a wide range of disciplines such as clinical psychology, speech and language, occupational therapy, advocacy, and others. 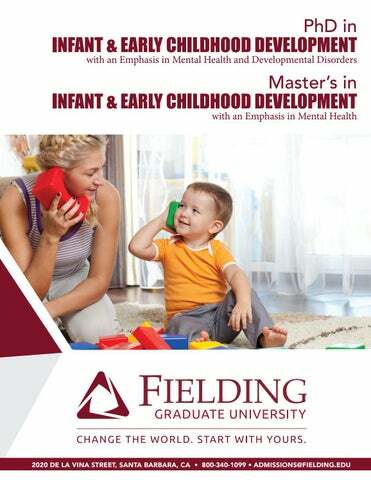 Please visit http:// www.fielding.edu/our-programs/school-of-leadershipstudies/phd-infant-early-childhood-development/ faculty-iecd/ to learn more about our dedicated and professional faculty. FREQUENTLY ASKED QUESTIONS also change mentors as you go through the program if you determine someone else is a better fit for your needs at that point. match their research interests with those of the professor, or can students choose a dissertation topic related to their own interests? A: IECD PhD students can determine their dissertation topics based on their own personal passions. Our faculty members are committed to helping students reach their individual dissertation goals. Q: What concentrations are available, and what classes can I take? A: You can choose from a wide variety of pre-approved concentrations. You can take the courses in the concentrations as part of your elective options. Q: Does adding a concentration extend the number of years to completion? A: While it does not need to extend time in the program, it may do so for some students who would like to complete courses beyond the required number of electives. Q: When can I begin working on my dissertation? Q: How are the curricula presented online (video presentations, discussion forums)? Are there a lot of group projects, or are there more individual projects than group projects? Do students do a lot of group projects, or do faculty assign more individual projects? A: Coursework is completed online, and the majority of classes are taught live via Zoom synchronous meetings. Papers are posted online, and faculty respond by e-mail to individuals regarding written work. In some classes, students work in small groups, while in others, students do individual presentations. The course syllabi, available before registration, outline course delivery methods and expectations. A: Fielding students can utilize Disability Services, Student Accounts, Library Services, Office of the Registrar, Student Advising, Financial Aid, Scholarships, and Information Technology Services. A: If you already have a strong sense of your topic when you enter the program, you can begin working on your dissertation by focusing on it during core courses. You can run searches and acquaint yourself with the literature as you are going through the program, and you can have conversations with faculty members about your topic. We encourage students to begin thinking about their dissertation topic in the pre-New Student Orientation and New Student Orientation. YOUR MA COURSEWORK IECD MA FOUNDATIONS (16 CREDITS) This master’s program is a multidisciplinary program with an emphasis in infant and early childhood mental health. Students will study multiple factors affecting an infant’s, child’s and family’s well-being, including social emotional, brain, and cognitive development, as well as school readiness, family systems, and mental health. The faculty teaches typical and atypical infant, child, and family development from a strengthsbased approach using a curriculum that includes physiological, emotional, cognitive, behavioral, social, and cross-cultural perspectives. Students will enter the program in one of two chosen concentrations. For students who complete the MA and are approved to continue on to the PhD in Infant & Early Childhood Development, some credits may be transferred from the master’s program to the PhD program. (physicians, nurse practitioners, and nurses), allied health professionals (occupational therapists, physical therapists, and speech and language therapists) as well as mental health professionals (social workers, marriage family therapists, and counselors). These concentrations offer a unique link between various disciplines within a relationship-based developmental framework. A common language across disciplinary boundaries is developed so that students can deepen their understanding of each of the disciplines. CAPSTONE For both concentrations, students complete a capstone project in their last term. OPTIONAL DOCTORAL CONCENTRATIONS Students can individualize their doctoral program and expand their professional expertise by selecting one of our shared doctoral concentrations. Gainful Employment: visit Fielding.edu/GainfulEmployment for information on educational debt, earnings,and completion rates. Visit www.fielding.edu/our-programs to learn more about our programs. Fielding Graduate University is accredited by the WASC Senior College and University Commission (WSCUC).